The 10 Best Ice Skating Rinks in Michigan! When the holidays have passed and you’ve got nothing but the frigid cold of winter in Michigan, what better way to shake yourself out of a slump than with some physical activity? 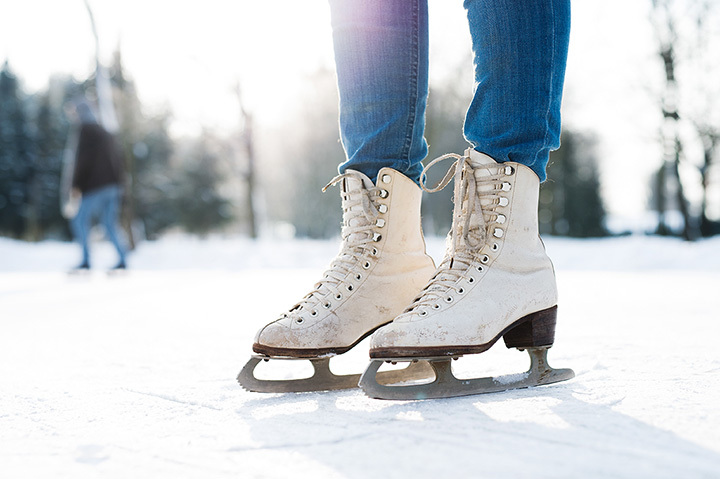 Take advantage of the season by lacing up the skates and heading down to your local rink to hone your hockey skills, sharpen your figure skating spins, or simply enjoy a day of leisurely skating. Here are the 10 best ice skating rinks in Michigan. When the holidays have passed and you’ve got nothing but the frigid cold of winter in Michigan, what better way to shake yourself out of a slump than with some physical activity? Take advantage of the season by lacing up the skates and heading down to your local rink to hone your hockey skills, sharpen your figure skating spins, or simply enjoy a day of leisurely skating. Here are the 10 best ice skating rinks in Michigan. Not to be confused with the rink of the same name in Chicago, the Ice Rink at Millennium Park in Portage represents the first refrigerated outdoor rink in Michigan. In the warmer months, it converts to a reflecting pond, so whether you're sliding gracefully over the top of it balanced on a razor's edge or gazing contemplatively into its waters, you'll always have something to do at Millennium Park. Plus, it's in the middle of Portage, so when the cold gets too much, a host of restaurants awaits nearby for a snack or hot drink. Using a phrase like "two NHL sheets of ice" is a great way to draw attention to an ice rink, and that's just the kind of impressive operation the Southside Ice Arena in Byron Center is running. There's more going on here than just ice, though, as there are open skates on Saturdays, drop-in hockey for adults on Sundays, and even middle school skate nights for the younger set. Pretty much anyone who wants to get out and enjoy a night on the ice can do so. Skate rental is on hand, as is one other exciting feature: The All in Stride skating treadmill. Described as "a synthetic ice treadmill" that offers up to a 35 percent incline, it's great for training and gaining power. Traverse City...what doesn't it have? Traverse City is home to shops, hotels, agriculture and art, and now, it's got an entry in the best ice arenas thanks to the Centre Ice Arena. The home of the NHL Prospect Tournament and the Detroit Red Wings Training Camp, there's a lot of professional talent that goes through this location. For those not sufficiently skilled to go pro, however, there's still excitement afoot. Open skate programs, including open figure skating programs, are on hand as well as a drop-in hockey league along with hockey schools. Youth and adult tournaments are also in play for those who want to check out the best in skating. Rated one of the top six "bucket list" skating locations by Pure Hockey, the Yost Ice Arena has been home to the University of Michigan Wolverines team since 1973. Modernized in more recent days, it offers not only history, but also a sound skating experience as well. Offering adult hockey and training programs, a public skate program, and several other features, Yost Ice Arena covers most of the bases complete with a historical bent. Normally, people think of the Lake Michigan beach when they think of South Haven, but South Haven doesn't shut its doors in the winter months. On the contrary, South Haven embraces winter as much as the rest of Michigan does and that's clear in the South Haven Ice Rink. Offering skate rentals and a host of activities from open skating to curling-yes, curling-there's a large pavilion roof over the rink which helps protect against harsh winter weather and a cooling system under the ice to help keep the ice at a steady temperature regardless of the weather outdoors. So when the skating season is on, it's on, and in a big way. Check out the New Year's Eve party for added fun! Chelsea plays host to a large, impressive ice arena, the Arctic Coliseum. Skaters at the Coliseum can get in on learn to play/learn to skate activities, adult hockey leagues and practice sessions, and even a complete fitness center on the grounds. The real winner, however, may be the Saturday Night DJ Skate, in which the Arctic Coliseum pulls out all the stops and throws on the black light and lasers to give the arena a convivial atmosphere for skating fun. Skate rental is on hand, and following a hard day of skating, the Arctic Breakaway restaurant and bar is ready to recharge hungry or thirsty skaters eager for a bit of a break. Echo Valley is a complete winter sports park in Kalamazoo, boasting tubing and tobogganing fun for those who want high speed winter thrills. For those who want skating, however, that's where Echo Valley really shines. A 43,000 square-foot ice rink-just shy of one full acre of ice-that's routinely resurfaced and groomed, it's going to be the kind of skating experience that doesn't come along just every day. Throw in a skate shop with skate rentals-rentals are actually free with the rink admission, reports suggest-and a warming lodge with various concessions on hand, and the end result is an exciting day on the ice, on the snow, and beyond. Welcome to Ann Arbor, where the ice skating season goes to even when it's warm enough to go out in a light jacket. The Buhr Park Outdoor Ice Arena boasts a cooled subfloor, allowing the ice to remain sufficiently static for skating even in temperatures up to better than 50 degrees. Public skating is on hand, and drop-in hockey with skate rentals is on hand. There's even a skate sharpening service available to allow skaters to put a fresh edge on their blades and carry on. Throw in a heated lobby and vending machines and it's a great recipe for a good night on the ice. The accompanying Buhr Park, meanwhile, offers a variety of attractions all its own. The fact that Kalamazoo has a semi-pro hockey team-the Kalamazoo Wings-comes as a surprise to some people, but a semi-pro team also means an ice arena. This Kalamazoo event center has long been a staple of not only ice skating, but also concerts, exhibitions and special events. Skaters, however, can get in on public skate events, drop-in hockey teams, and skate rentals. The rink is also known for its themed skating events and its monthly DJ skates. Perhaps the most popular is the annual Halloween Spooky Skate event, where the ice is dyed orange for the event to evoke images of sliding along on a giant pumpkin. Located all the way in Calumet, this is rink is steeped in more history than all the rest. As of 2016, the rink is 103 years-old. It's the oldest indoor ice arena that's still in use anywhere on the planet. There's actually one Michigan rink that would have beaten the Calumet Colosseum, the Dee Amphidrome (now Dee Stadium) as it was built in 1902, but as it burned down in 1927 and was immediately rebuilt, it now classifies as the seventh oldest entry. View more Michigan Ice Skating Rinks.